Vancouver has been my home for the last 35 years. Since 2002 the Economist Intelligence Unit has compiled a survey of the most liveable cities in the world. From 2002 – 2011 Vancouver held first place based on quality of life, stability, healthcare, culture, environment, education, and infrastructure. In 2011 it fell to third place after number one Melbourne Australia, and second place Vienna, Austria. I suspect Vancouver`s fall from top spot might have something to do with the fact it`s now ranked as the most expensive city in North America. 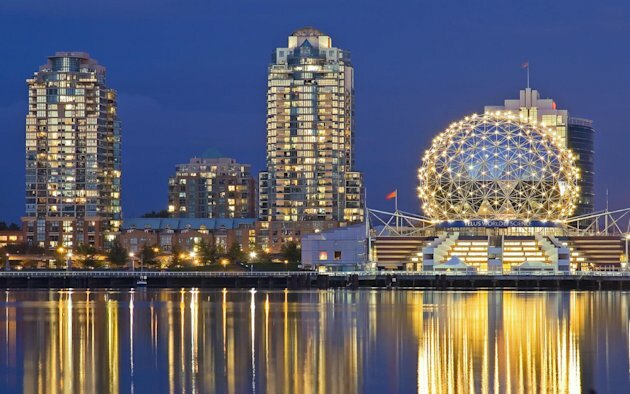 Real estate costs more in Vancouver than even Los Angeles or New York. Click on the link below to see a post written a few months ago about a house on the next block from mine that sold in 10 days for 1.6 million, and you`ll understand. Vancouver is a stunning place. The first photo I took tonight while working on the roof deck of Science World – the round building shown in the photo below. The body of water is an inner harbour named False Creek; as we worked dragon boat teams broke the water to the beat of a drum, sailboats settled in as the sun set, little water taxis chugged to and fro, music drifted up from pleasure boats filled with friends out for a perfect summer evening. It was a post card evening, responsible for erasing any negative gripes about my little corner of the world. And yes – even though you see grass and trees in the top picture; I assure you I was on the `green roof` the grass is planted on the deck at the bottom of the dome to absorb rainwater , and provide insulation.